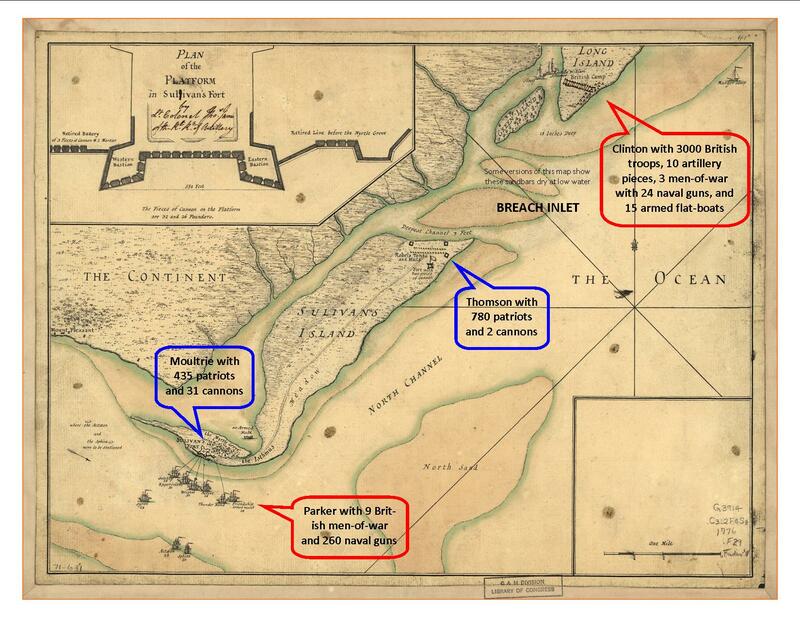 ATTACK FROM LAND AND SEA More than 12,000 British and American soldiers and sailors converged in the vicinity of Charles Town in early June 1776. The immediate British objective was to capture Sullivan’s Island. Their two-part strategy called for the navy to subdue Fort Sullivan by bombardment and cannonade and for the army to assault the fort’s vulnerable rear by land after crossing Breach Inlet. See the map below. MUTUAL SUPPORT The Americans hurriedly prepared mutually supportive defenses. Moultrie’s men inside the fort would defend against the British naval attack and Thomson’s men on the bank of Breach Inlet would defend against the British army attack. These troops on opposite ends of the island depended upon one another. If patriots at Breach Inlet failed to stop the army, Fort Sullivan was sure to fall. If the fort could not withstand the navy’s assault, the patriots at Breach Inlet would be surrounded and trapped. Having this map is a great visual tool for understanding the strategy of both sides! Thanks for including it!